After a decade of unabated growth, Apple is facing the long-anticipated reality that its iPhone sales have finally started to stall. Naturally, the company is looking to expand its footprint in other potential growth markets and its recent deal with Samsung to install a new iTunes app on its 2019 smart TVs is reflective of the new reality facing the Cupertino giant. Now, CNBC reports that Apple is currently in talks with Medicare providers in the US about the potential to subsidize its Watch for customers over the age of 65. Since its debut it first went on sale in April 2015, the Apple Watch has been reported on more than one occasion to have helped save lives by detecting irregular heart beats and alerting users. This is even before it officially received formal health certification for the Watch with the launch of the new Series 4 model. Apple has been harboring an interest in expanding into the health market for some time and has hired numerous doctors and health professionals to join its ranks in recent years. The Watch Series 4 features a FDA-approved ECG/EKG sensor built into the top of its Digital Crown, which Apple CEO Tim Cook just tweeted has been credited with saving a life by detecting A-Fib in a user. The Medicare subsidy could help to drive potentially hundreds of thousands (even millions) of additional Apple Watch sales in the US alone if Apple is able to strike a deal with private insurers. There are currently 19 million seniors in the US signed up to Medicare Advantage plans. Although no deal has been made, the opportunity and the market is clearly apparent and has the potential for expansion into other markets as well. 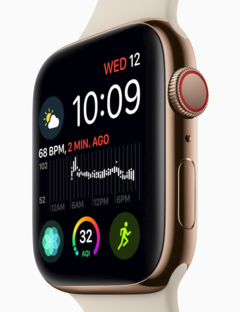 However, at this time, the US is the only market where the ECG/EKG feature has been enabled as Apple is yet to have the Watch formally certified by a health authority. Apple still makes healthy margins on the Watch, but they aren’t in the same order as its iPhone line. That said, its move into the health market globally has clear upsides for its total revenue.